Before his 20th birthday, Jacques-Laurent Agasse moved from Switzerland to France, with the idea of studying animal anatomy at a school of veterinary in Paris. He returned to his country and, around the year 1800, a wealthy Englishman asked him to paint a portrait of his dog, which had died recently. Agasse honored the commission and the Englishman, surprised by the quality of his work, takes him to London, where the artist will continue painting animal portraits. More specifically, equestrian portraits. Miss Cazenove on a Grey Hunter shows us Miss Cazenove going to hunt. Without any doubt, the woman belongs to the British upper class, which enjoyed sport hunting. 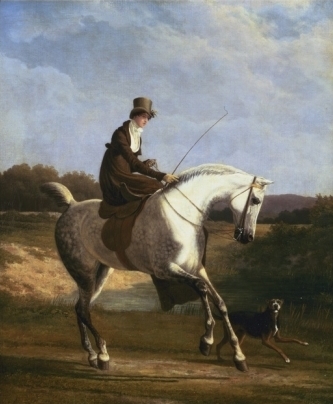 The “gray hunter” refers to the horse she is riding sideways gracefully. Below right, a hunting dog, also typical of this type of activity, runs along with them. Looking at the painting, it is not hard to realize that, for Agasse, the main character is the horse, no matter the title of the canvas. While we see him galloping in a dignified posture, the woman loses prominence and seems to appear incidentally in the painting. ~ by Álvaro Mazzino on March 8, 2013. Generally I don’t read article on blogs, however I would like to say that this write-up very compelled me to take a look at and do so! Your writing style has been amazed me. Thanks, very nice article. I’ll bookmark your blog and check again here frequently. I am quite certain I will learn many new stuff right here! Best of luck for the next! the viewers to pay a visit the site, that’s what this web site is providing. till now. But, what about the conclusion? Are you positive concerning the source? Wow! In the end I got a webpage from where I be able to truly get valuable information concerning my study and knowledge. type of magnificent informative website. This entry was posted on March 8, 2013 at 12:52 and is filed under Romanticism.You can follow any responses to this entry through the RSS 2.0 feed.You can leave a response, or trackback from your own site.